Thanks to eOne for sponsoring this post. As always, all opinions are my own. 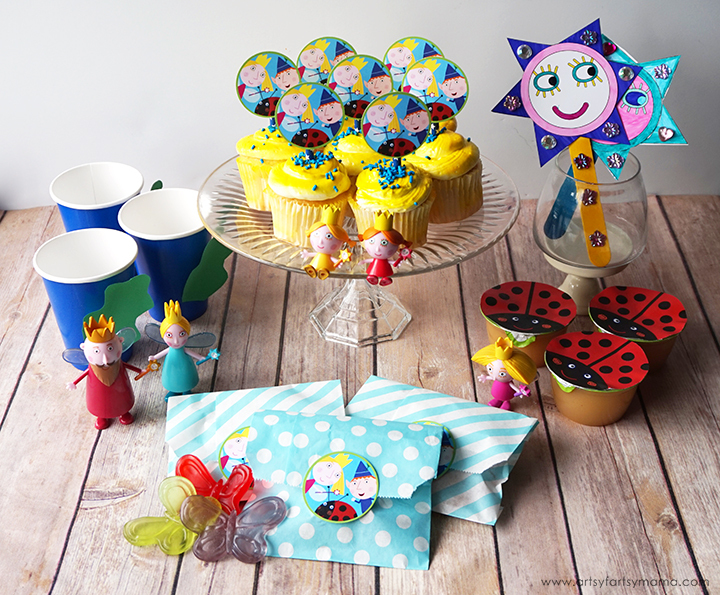 Throw a magical Ben & Holly's Little Kingdom Party with these simple tips and free printables! My daughter and I just discovered the new Nick Jr. series, Ben & Holly's Little Kingdom and decided to invite some friends over to have a little Ben & Holly's Little Kingdom Party! From the makers of Peppa Pig, Ben & Holly's Little Kingdom is an adorable show that shares adventures about the friendship between the fairy princess Holly and Ben Elf in the magical Kingdom of elves and fairies. Each episode shares tales of perseverance, friendship, and magical fun that kids of all ages are sure to love! While "Pinterest-perfect" parties are the goal most of us strive to achieve, our budgets don't always agree with our party plans. 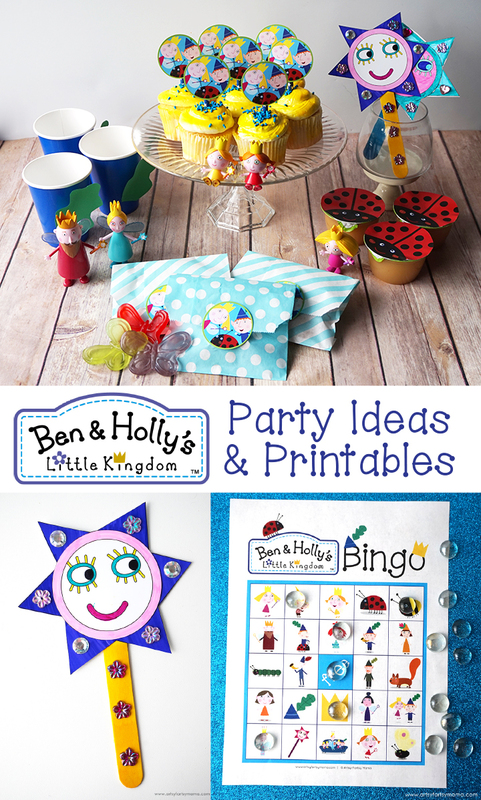 I know I'm not the only one in this predicament, so I wanted to share some simple tips, FREE printables, and more about how we were able to throw a magical party on a budget should you feel inspired to have your own Ben & Holly's Little Kingdom Party! Entertainment for party guests is one of the most important parts of the party. Not to worry, though. I've got you covered! The fairy princess Holly always has her trusty wand in hand, and now your guests can have one, too. 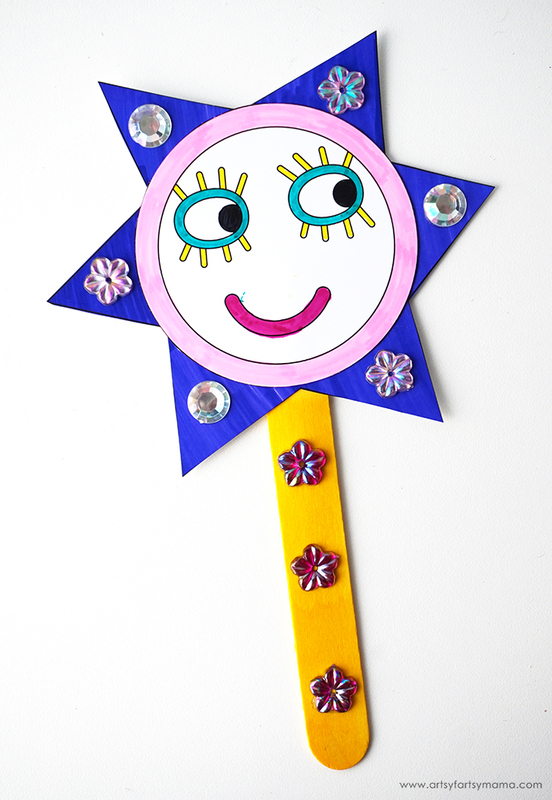 This is a simple craft for kids with minimal mess. 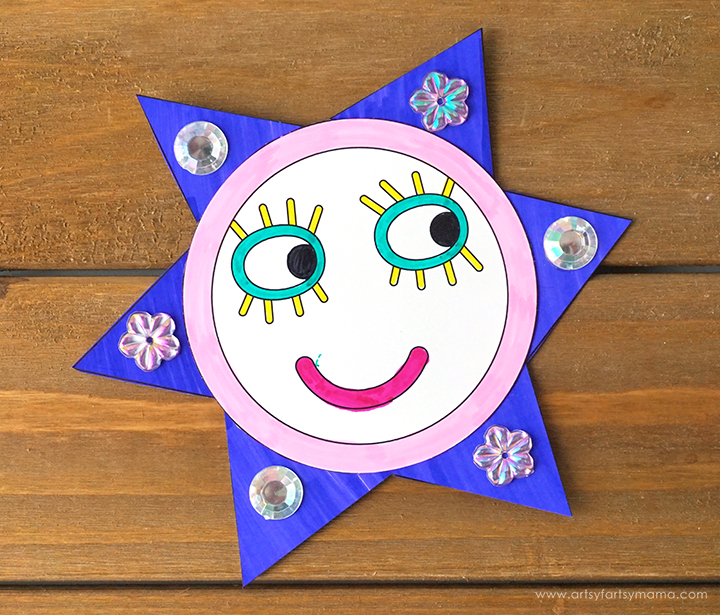 Step 1: Color both the wand "star" and the face with markers, crayons, or colored pencils. Step 2: Cut the pieces out with scissors. Smaller children will need help with this step! 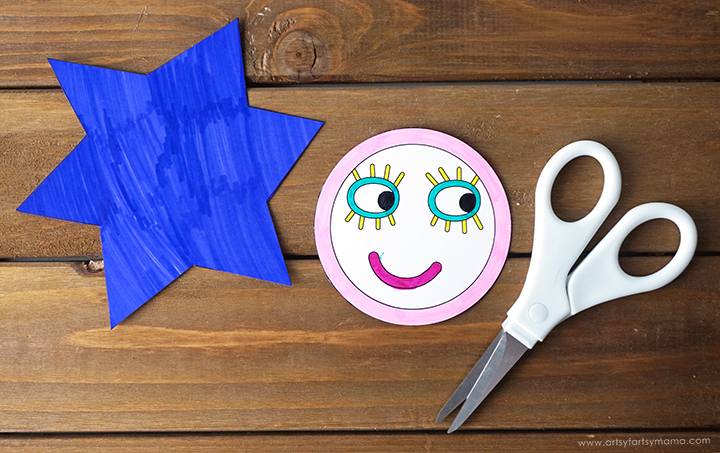 Step 3: Use glue or tape (I love using a tape runner) to attach the face piece to the center of the "star" piece. Step 4: Peel and stick adhesive-backed acrylic gems to the wand face. You could also embellish with glitter glue, stickers, or sequins! Step 5: Add some tape or glue to the top end of a craft stick. Press it on the back of the wand face. 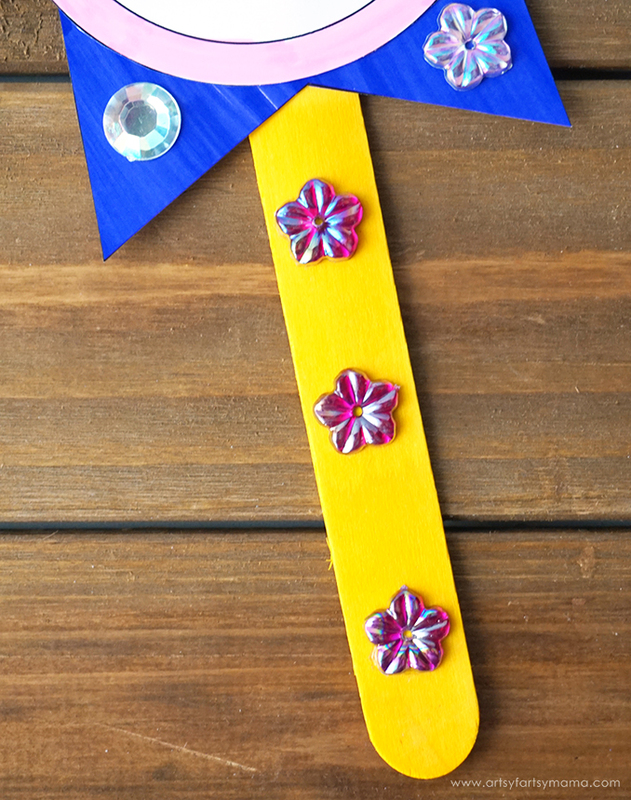 Step 6: Embellish the wand "handle" with more gems. Now your guests can have fun creating magic like Holly!! We whipped up some wands to start the party, then watched a few episodes of Ben & Holly's Little Kingdom. The kids loved mimicking Holly and the silly magic spells with their own wands. 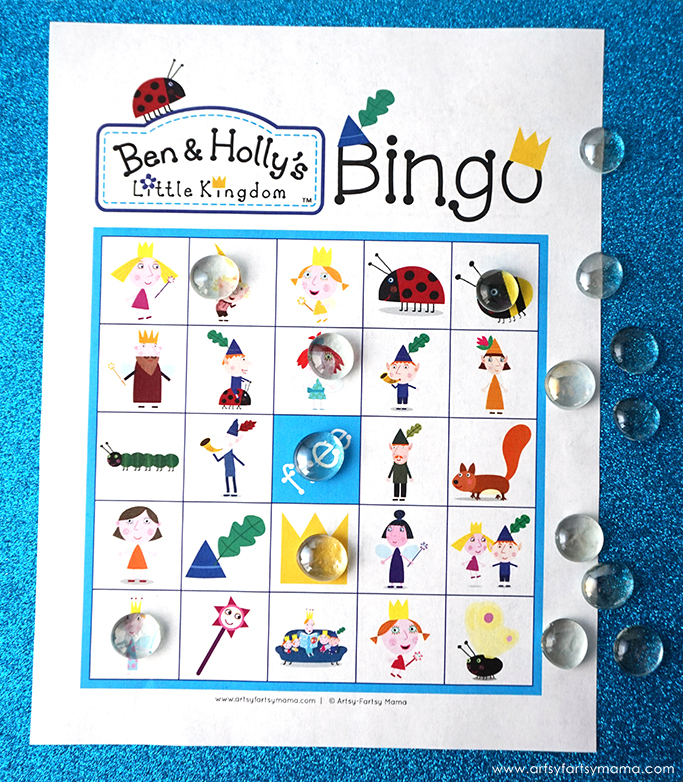 Don't forget to download and print out Free Printable Ben & Holly's Little Kingdom Bingo to play with friends. 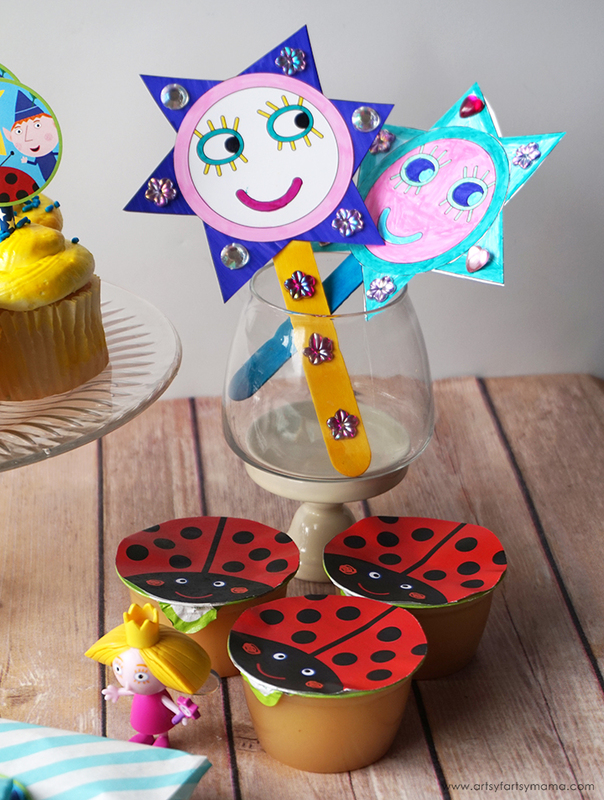 It's a fun way to add some Ben & Holly magic to your party! The bingo printable comes with 10 cards in a set, or a blank set so you can create your own. Kids of all ages will have a great time playing this game! When it comes to party prep, I like to keep things simple. We found some applesauce cups on sale, and decided to dress them up to look like Gaston, the ladybird from the show. 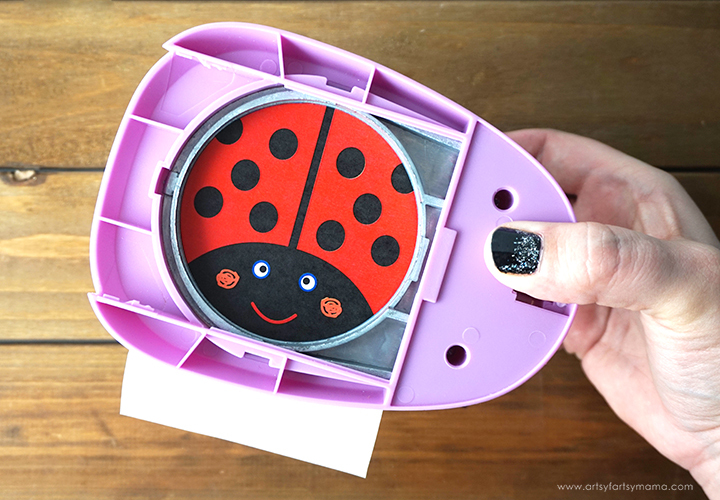 All you have to do is print out the Gaston Printable Labels and cut them out with a 3" circle punch or scissors. Add some tape to the back of the labels and attach them to the top of the applesauce cups. Now you've got some snacks that fit your party theme with minimal work! Place the Gaston applesauces on the table to be easily accessible to your guests. We also added a glass cup as a place to hold the magic wands while they weren't being used. This helped to keep wands from getting stepped on, spilled on, or lost throughout the party. To keep our guests hydrated, we served Fairy Juice (pink lemonade) in blue cups that resemble Ben's hat. To make the hats, I simply cut some leaf shapes out of green paper and attached them to blue paper cups with tape. 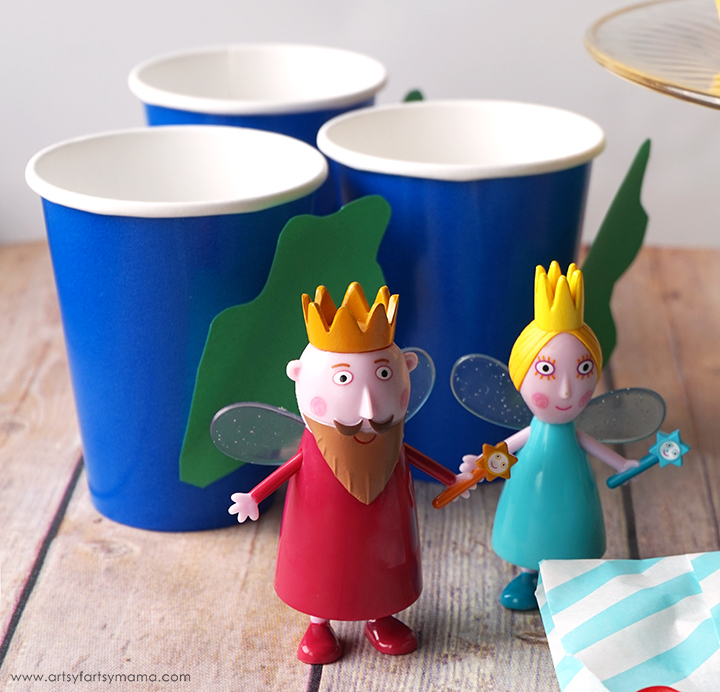 We also placed some Ben & Holly's Little Kingdom figures on our table for more magical fairy fun! Our table centerpiece was some vanilla cupcakes with yellow frosting and blue sprinkles on a DIY cake stand. I embellished the cupcakes with some Free Printable Cupcake Toppers cut out with a 2" circle punch with a paper straw (cut into 1/4) taped to the back. I also added the adorable twin fairy figures, Daisy and Poppy, to the plate as well. Such a colorful and fun addition to our party table! 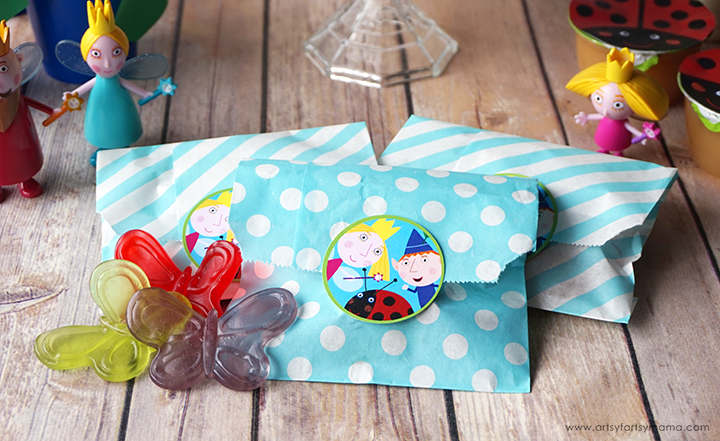 Last, but certainly not least are our Ben & Holly's Little Kingdom party favors. We filled up some colorful paper treat sacks with gummy butterflies and pretzels as a thank you to our guests for coming to our party. Then, I printed out some more cupcake toppers and taped them to the sacks to keep them closed. This party was a ton of fun to put together, and the kids had a wonderful time. If you haven't already, be sure to check out Nick Jr.'s Ben & Holly's Little Kingdom! You can also follow the fun on Facebook, Twitter, and watch their videos on YouTube! 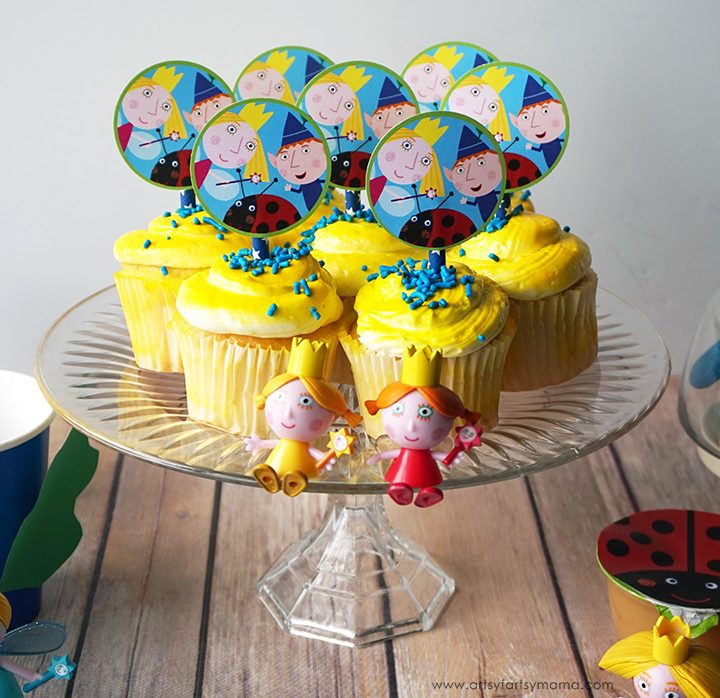 Who is your favorite Ben & Holly's Little Kingdom character? This is so cute! My kids love this cartoon. Thanks for all of the photos and downloads. It makes party planning so much easier! This turned out great! You did a amazing job putting this all together! This is awesome!! I love it! Your pictures are so vibrant too! This party looks great! Love the budget-friendly options and the free printables! The applesauces are adorable!